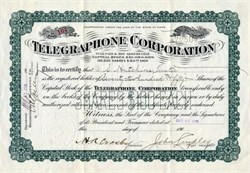 Beautiful certificate from the Telegraphone Corporation issued in 1906. This historic document has an ornate border around it with a vignette of the company name. This item has the original signatures of the Company’s V. President, John Lindley and Secretary, and is over 107 years old. Poulsen developed an arc converter in 1908, referred to as the "Poulsen Arc Transmitter", which was widely used in radio before the advent of vacuum tube technology. After considerable investigation the writer has succeeded in obtaining some definite information regarding the present status of Poulsen's telegraphone in America. An interesting account of that wonderful instrument appeared in the "Annual Report of the Smithsonian Institution for 1901" (pages 307312) and another description thereof by Dr. George M. Gould, the eminent ophthalmologist, of Philadelphia, was printed in Science (New York) for February 16, 1906. Those two articles should be read by all interested in the future application of the telegraphone to the work of and for the blind. Theoretically, the machine is manufactured in three styles, using, respectively, (1) a steel wire, (2) a steel ribbon, (3) a steel disc. The last form promises eventually to become very useful to the blind, because it will afford a means for conducting oral correspondence by mail, as the steel discs are small and can easily be posted. Up to the present time practically the only telegraphones manufactured have been produced by the original inventor, in Copenhagen, Denmark. The patent rights for all or many countries, aside from the United States, are owned by the Telegraphone Corporation, of which Mr. John Lindley is the president, with office at 32 Nassau Street, New York City. The selling rights in the United States are possessed by the American Telegraphone Company, 41 Park Row, New York City, who also own special patents on the disc machine, but they apparently have no right to sell instruments in Europe. Their factory at Wheeling, W. Va., has met with some delay in turning out the new American disc-telegraphone, owing to the necessity of making certain tools, but it is expected that machines will be completed and put on the market for sale in the near future. The first practical form of "magnetic" recording (that is, the kind of recording process used with videotape, audio tape, computer hard drives, etc.) came in the form of sound recording on steel wire. Between about 1898 and 1900, Danish inventor Valdemar Poulsen developed and patented the"Telegraphone." VALDEMAR POULSEN, of Copenhagen, in the Kingdom of Denmark, for the invention of " Method of and apparatus for effecting and storing up of speech or signals by magnetically influencing magnetisable bodies," bearing date the 28th April, 1899, and numbered 8961, and in the Matter of the Patents and Designs Act, 1907. NOTICE is hereby given, that it is the' intention of the Telegraphone Corporation, of 32, Nassaustreet, New York City, United States.